Easily the longest day of my life. Seriously. I thought the day of her heart surgery seemed long. But it was so different. The heart surgery took about 4 hours, I think, so we waited a long time. Because it could have been touch and go, I recall being terrifically relieved to see Dr. Mavroudis walking toward us with a smile on his face. Setting Charlotte up in her PICU recover took hours. 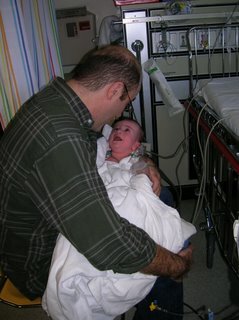 And when we saw her after heart surgery she was paralyzed and sedated. We never saw any discomfort–by the time the paralytic drugs were stopped, she’d passed the discomfort phase. Monday was totally different. 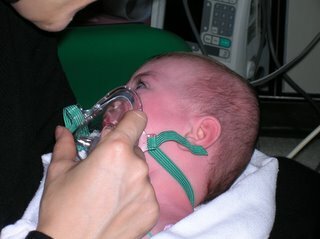 The G-tube insertion took about an hour, including anesthesia. We had barely finished our coffee when Dr. Reynolds popped her head into the waiting room to tell us that the procedure had gone well. A few minutes later we went to Charlotte’s bedside in the Recovery Room. Because they had used a short, non-narcotic dose of anesthesia, Charlotte experienced a little of something called “emerging delirium”. Fortunately, her anesthesiologist, the dapper Dr. Tobin, forewarned us. Basically, she screamed and was inconsolable off and on for about 30 minutes. She was awake, but not aware of her surroundings, so she didn’t realize that we were there to comfort her. I had a tough time with it. Philippe took over and did a great job with her. When this was over, we moved to the 5th floor for observation. Philippe and I had a quick lunch and then I stayed with the baby. She cried on and off all day and had a hard time sleeping. While there was some discomfort, little Charlotte was mostly ticked off because she had not eaten since midnight Sunday night. It was so difficult to watch her. No food by mouth and nothing allowed in her stomach for 12 hours post-surgery. I was not terribly effective in comforting her. Thank G-d for Nurse Annette who did a great job with her. The “tube-tail” that sticks out is longer than I thought it would be. It’s essentially like a Foley catheter, yellow-ish rubber, with a capped extension tube at the end. The dressing on the wound is a larger round bandage with a hard plastic clip that sticks out about Â½ inch from her skin. For several hours after the surgery, the wound leaked and dripped. Busy little Charlotte tried to play with the tube so Annette got her a little hospital gown to cover it up. In theory, Dr. Reynolds’ nurse will change the dressing next week and then I’ll change it weekly until the button is placed. In practice, I’m guessing I’ll take her to surgery clinic every week to have the dressing changed. Philippe and I had dinner and then he relieved me. Sometime during the night Charlotte started getting Pedialyte via her new tube and she was able to sleep for several hours. Philippe even got 4 or 5 hours sleep. Our pal Sam came by on her way into shift in the PICU to visit and then picked Philippe up at 6 am for a Starbucks run. Apparently when she popped in at midnight, Philippe and baby were fast asleep. I was quite relieved to hear that. The weirdest thing was coming home to an empty house. I’ve slept alone in the house before, but not since the baby came home in June. I had myself a good, cleansing, stress-relieving cry and then long chats with Colleen and my sister. Even with half an Ambien it took me forever to fall asleep. The family of Charlotte’s first roommate was terribly angry and stressed out. They were yelling at everyone. I was glad when the patient was released because the negative vibes were definitely not good for us or Charlotte. The “Angry Family”, as I dubbed them, just wanted someone to blame and insisted on going home, as if hospital were jail. They were clearly unwilling to consider lifestyle changes for their overweight, sedentary teen in order to help with her heart condition. It was hard not to give them a piece of my mind, actually. The experience showed me why most of Charlotte’s medical team have been so very gracious to us–we are so thankful for the expertise and grateful for their compassion.